Tarana Burke remembers the first day she saw “Me Too” used on Twitter — Oct. 15, 2017, when actress Alyssa Milano used the phrase in response to the sexual assault allegations against producer Harvey Weinstein. Burke, who is known as the first person to use the now-popular phrase, is a supporter of the #MeToo movement on social media, but she doesn’t want people to see the viral slogan as a solution to the problem. “The solution is listening to the people who’ve had experience, not making more hashtags,” Burke said. 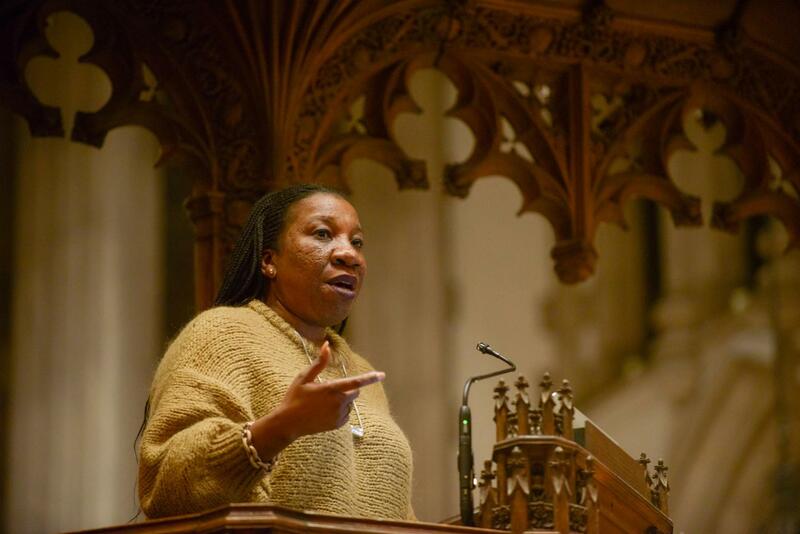 Burke, a civil rights activist and community organizer, stopped by Pittsburgh Tuesday night while traveling around the country to speak about what the movement means to her. At the event hosted by PublicSource, about 1,000 people gathered in the Calvary Episcopal Church on Shady Avenue to listen to Burke discuss how the movement came about and how it has affected other people. The #MeToo movement spread on social media after sexual misconduct allegations against Hollywood producer Harvey Weinstein, but Burke began using the term in 2006. “Standing up for something I knew was wrong solidified my understanding for these issues of sexual assault,” Burke said. Attorney Jennifer Price started the evening by introducing Burke’s background and the development of the #MeToo movement. Price also mentioned the importance of bringing more awareness to the issue of sexual assault, especially for women of color. “On stage, she provides words of empowerment that lift up more voices and enable survivors of all races, genders and classes to know that they are not alone, and to offer a place of comfort and healing for those who have experienced trauma,” Price said. Burke walked on stage minutes later to begin her speech on her life story and her purpose for starting the movement. She started by talking about her first experience meeting someone who was a victim of sexual assault. At a youth camp Burke worked at in the summer of 1997, she met a young girl whom she calls Heaven who told Burke she was sexually assaulted by her mother’s boyfriend. Burke, a survivor of sexual violence herself, said she couldn’t bear the personal pain of consoling this girl, in whom Burke saw a lot of herself. “The reason why I’m traveling around the country and having these conversations is because I think that people have read so many things on social media, but very rarely do we get to hear from the person directly what their story is and what this work is about,” Burke said. Throughout her speech, Burke focused on how community organizing can help curb sexual assault and violence. She said she realized there was community organizing around “every other issue,” but not sexual violence. Andrea O’Leary, 29, from Upper St. Clair, attended the night’s event and said she felt comforted by Burke’s speech. “It’s nice to feel like it’s not a ‘my issue,’ it’s an everybody issue,” O’Leary said. Some attendees, such as second-year medical student Jymirah Morris, wanted to take the opportunity to hear from the woman who created the #MeToo movement. For Revathy Pillai, a sophomore neuroscience and anthropology major, the night was about inspiring change. “People who are very closed-minded can change and gain that capacity to hear everyone’s stories and make a difference that needs to be made,” Pillai said. Moving forward, Burke sees college campuses across the country as the place where change can continue to happen.